I created this Podcast series based on my own personal experiences with my mental wellness journey. I highlight those experiences on my Instagram page and I also wanted to be sure to add my voice in a collective generation that is finally starting to become more open to discussing our experiences. To share real unfiltered thoughts and conversations around Mental Health and bring compassion, awareness, and clarity surrounding the topic. This show includes collaborations and conversations from inspiring boss women who come from different backgrounds and share the commonality of working in creative industries. They will be sharing their personal journeys, their everyday struggles, and unique revelations. An opportunity for you to breathe easy, find connections through conversations, and space to feel represented. Stay connected as this series will span throughout the Fall/Winter 2018. Click below to begin listening to the episodes from this limited series. Available NOW on the platforms below and on most other Podcast distributors. Be sure to follow the BreathingSpacePodcast on IG to keep up with the latest updates. My journey through wellness both mentally and physically, along with my compassion for creating media content to help support the wellness of the community, is being brought to fruition with my most recent project. 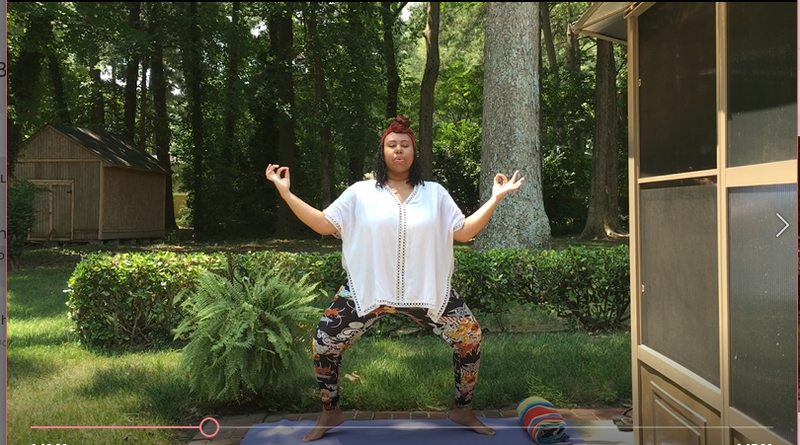 I am excited to announce my collaboration with Yoga Green Book, the online platform supporting all shapes, colors and sizes, including women of color! Yoga Green Book is an online safe space for people of color to transform their mental and physical health in order to live healthier, happier, and more fulfilled lives. The site features yours truly, along with other certified yoga teachers who are ready to support you on your next level to wellness. The classes are available completely for FREE with a 30-day studio trial. My goal with this space is to share organically when it feels right. When I feel inclined to share an important shift taking place, I’ll be sure to express. Recently, I shared that I have been enjoying a plant-based way of eating as one of many self care tools I am embracing. I’ve taken on this journey for several months now and I’ve noticed a lot of changes along the way. 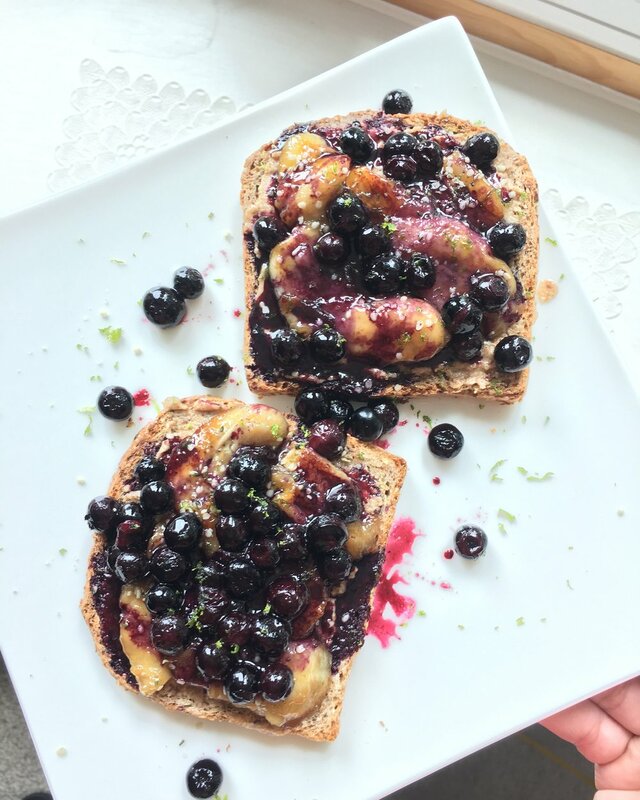 Homemade breakfast toast: Ezekiel Bread with homemade almond butter, topped with pan fried banana and caramelized blueberries! I’m having so much fun creating! And as I am learning to come home in my body, I am able to notice when it craves different needs. Making Homemade Granola is another example of simple ingredients made easy. With just coconut oil, maple syrup, assorted nuts and seeds and baking it in the oven, it becomes a simple, yet delicious and versatile way to incorporate a lot of goodness for the body. Because I am getting more into homemade meals, more specifically plant-based, I wanted to share with you all my five personal reasons why I have chosen to embrace this plant-based lifestyle. I've gotten out of my food comfort zone by trying different types of vegetables, legumes, seeds, fruits. More than I've ever had which has not only expanded my food pallet but has allowed me to take in so many different vitamins and minerals that I wasn’t doing as much of prior. I'm rediscovering my love for cooking. I'm enjoying different types of meals and getting creative using different vegetables and sauces and spreads to create and spark really great food ideas. Environmental Benefits! I know I'm contributing in a positive way for the environment and it feels good to know that simply through my actions, I am making an impact. I just feel so much better! I feel lighter clear-headed and more inspired. I noticed a difference in my skin as soon as I removed dairy from my diet. And because I've made a these conscious choices, I feel it has positively influenced how I move in the world. It’s rewarding! Knowing that without relying on meat and dairy, I've gotten more experimental with seasonings and textures and foods that bring delicious flavors really feels like an accomplishment. Everyone has a different path on what foods works best for their body. For me and the journey that I have chosen, plant-based meals have really been a life altering experience. As I continue to learn and grow I can only see myself getting more and more involved with not only how I can get creative with my food but in life overall, and that is truly a nourishing feeling. A year ago around this time, I started my Yoga Teacher Training. Truly a full circle moment for me. It's because of this milestone that I am sharing a few moments from my experience. Exploring through images, this beautiful time as well as the amazing people I was blessed to be around during this process, made for such a memorable experiance. I wouldn't have gotten this far if it wasn't for these gorgeous souls helping to continue to push me in the most loving ways when it was such a scary leap to take in the beginning. The time, travel and commitment was something new and had me fully adjusting to the changes I was experiencing. There was plenty of second-guessing and doubt but through God's grace, I am so glad I pushed through. From the first day, seeing the welcoming smiles, seeing all of the different supportive tools, the nervousness immediately melted away and quickly I felt in my element. 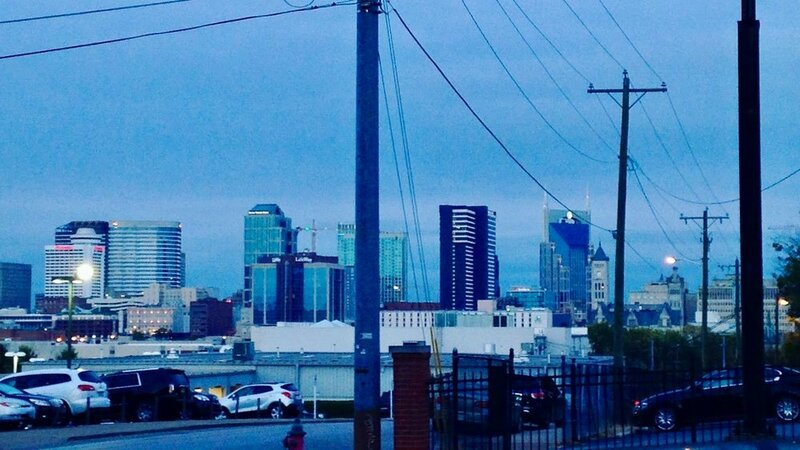 And then, I was introduced to the charming city that is Nashville. Standing at the John Seigenthaler Pedestrian Bridge. Considered one of the longest pedestrian bridges in the world. It was such a relaxing space to be in. Of course Nashville is known for their restaurants but what was cool was being able to experiance the mixing of food and art/music of different genres. Loved the vibes. Little hints of rassuring words sprinkled around Nashville. Found this gem while at a local restaurant. One of the sweetest souls I have met. It was a true honor to be selected to participate in her Curvy Yoga Teacher Training. She provided such a safe, nurturing, and loving experience. This space allow me to open up and stretch outside of my comfort zone and test what my body could do. With that, I learned so much about who I am and what I am capable of. I grew so much from this experience. This picture was captured on our last day of training. I remember being filled with so much gratitude. In that moment a slew of emotions rushed over me. So much excitement but at the same time sadness with knowing I had to say goodbye to my Yogi Sisters. Ideas were flowing on how to share what I just learned with others. Such a precious time. This moment was just the beginning of what continues to be such a meaningful process.